Developed by French Bread (Melty Blood) and published by Arc System Works (BlazBlue, Guilty Gear), Under Night In-Birth Exe:Late delivers pretty 2D fighting that can stand with the generation’s best. Forget the word salad title, this game brings the fight. 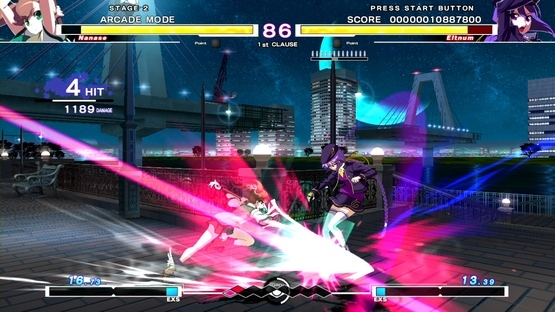 Under Night In-Birth Exe:Late comes with all the modes we’ve come to expect from fighters over the decades: arcade, Vs (online and local), time attack, score attack, and survival. Fight well to unlock videos and images in the gallery. Players can also edit the characters’ appearances in a customization menu. In-Birth doesn’t feel quite as packed with content as others in the genre, but that’s of course not a huge problem. The most important part of a fighting game is, duh, the fighting, which is lots of fun online and off. This has either been imported by a lot of people or has a seriously passionate player pool, because finding online matchups hasn’t been a problem. The connections have stayed strong, whether fighting opponents international or domestic. I never disconnected and the small amount of lag hasn’t been severe. 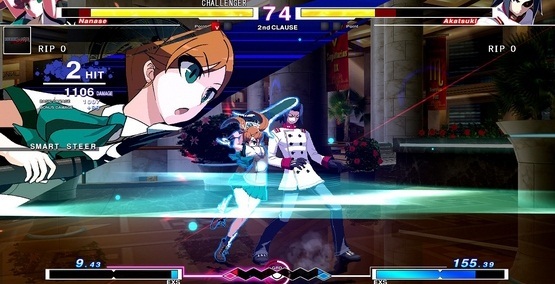 Critical to any fighting game are its controls, and as it does with all of its games, Arc System Works has made sure players can get into Under Night and let the moves fly. You’ll need to be pretty quick with your inputs, but get your timing right and you’ll find these controls quite responsive and natural. For those that want to make bringing the pain a little easier, the control scheme editor allows players to simplify combos. Under Night‘s cast is overall well balanced. Waldstein and to a lesser extent, Gordeu, seem slightly overpowered; while Chaos and Seth are hands-down the low end, but careful tactics and mastered combos can sometimes overcome the minor balancing issues. I don’t usually cheer for patches, but it might be nice to see a small one there; even without it, the game comes with balance good enough to make it worthy of time and attention. The story is the typical fodder that comes with a fighting game. We’ve got wacky characters that need an excuse to fight. Here, fight. Go. There ya go. So goes the majority of the fighting genre. It doesn’t have the humor level of BlazBlue‘s story mode or the already established, RPG-borrowed characters of Persona 4 Arena, but it does its job well enough. Exe:Late looks pretty at all times, with that cool anime style that fans will recognize from most other Arc System Works fighters. Some of the voice acting sounds a little bit muffled, like there’s not a problem with the voice, but the microphone doing the recording — not all, just some. Apart from that minor awkwardness, the game is quite good visually and aurally. The high-energy soundtrack is of particular note. Fans of 2D fighters have a good one on their hands with Under Night In-Birth Exe:Late. This is a pretty short review because I can’t find too much to say about it other than it’s been ton of fun. That’s kind of my curse when it comes to good fighters; not much to say when everything just falls into place. Short and sweet can work just as well. This game has all the modes you’d expect from any fighter, though without much more meat on its bones, it’s hard to say just how long you’ll keep playing. When it comes to the most important pieces, however, Arc System Works has delivered yet another praiseworthy title worthy of attention from fighting fans. Review copy obtained via Play-Asia.com. The game’s menus are almost completely bilingual, with large English print right there for you. No need to worry about this one. Going deeper inside the menus, there are a few things only in Japanese (difficulty, number of rounds per fight), but these can easily be solved with good old trial and eror. You will at least know the type of sub-menu you’re in, which will help (see screenshot within the gallery above). Dialogue is narrated and written. No furigana for novices, so if the combination of kanji and voice work can’t keep you afloat, be warned that the story will go over your head. As far as the main gameplay goes, it’s a fighter and you won’t need much explanation. If you do, there’s this. 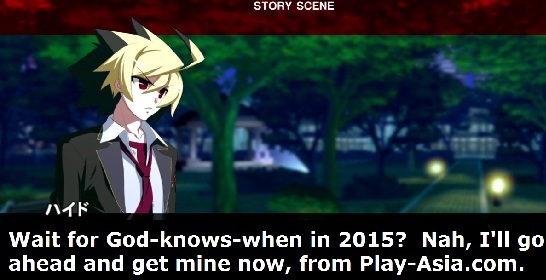 Aksys is said to be bringing Under Night In-Birth stateside in 2015, with no specific release date at this time.